Kel Tec make an amazing range of pistols. Valued by many gun owners for their lightweight design, deadly accuracy and use of the latest technologies in weapon design, if you own one of these fine guns it is worth investing in a quality holster to carry it in. This can be harder than it sounds, however. As Kel Tec pistols have become more and more popular, many holster manufacturers have brought out holsters for almost every Kel Tec pistol. This means that nowadays there is a bewildering variety of holsters available for almost any pistol you care to mention. Picking the perfect one is correspondingly difficult. That’s where we come in. After reading hundreds of reviews, talking to loads of people who take their Kel Tec really seriously, and trawling through seemingly endless forums full of people discussing the pros and cons of various holsters, I think I finally know which holster you should buy for your Kel Tec. The DTOM Combination Pocket / IWB Holster is my choice. First and foremost, the convenience of being able to swap between pocket and IWB carry with this holster easily sets it apart from the majority of the competition. In addition, it offers superior concealment whilst not compromizing on the safety features you would expect from a good holster. As long as your draw technique is correct, this holster also offers lightning-quick response. Unlike a lot of pocket holsters I’ve come across, the material this one is made of does not snag on the lining of your pockets, and as a result your gun comes out of your pocket smoothly, leaving the holster inside. For a fabric holster, this is a great item because it offers a good level of protection against accidental discharge. The holster almost completely covers the trigger mechanism of your weapon, ensuring that the chances of you shooting yourself are reduced. It rivals some rigid-body Kydex holsters in terms of security, and this is one of the reasons this holster is used widely by law enforcement professionals. In short, this holster contains all the features you would expect in a premium item, whilst also giving a superior level of concealment. If you’ve invested in a Kel Tec pistol because you want advanced features in a lightweight design, you should expect the same from your holster, and this one delivers on all counts. 1 The DTOM Combination Pocket / IWB Holster – Is It For You? Our review process is designed to find the best holsters and gun accessories on the market today, and we are very proud of it. Here at GND, we know that we are just a small part of a much larger gun community, and we use the skills and experience of this community when reviewing all the products we look at. First and foremost, for this type of review I read everything available about the holsters in question. Whilst the marketing materials of manufacturers tend to be full of inflated language and grandiose claims, the reviews of those people who actually own and use these holsters are strikingly honest. It is these reviews that the current one is based on – I have read hundreds of reviews of holsters for Keltech pistols, and where someone seemed particularly passionate in their views, I contacted them for further information. Having looked at all the holsters available for Keltech pistols, we then ordered a batch of them. Nothing can beat the experience gained from actually using these holsters, and we could never recommend a holster that we had not personally used. Sometimes, what seems like a fully featured, high-end holster can actually be a pig to use, and without walking around for a day with it strapped to you there is no way to know this. And so, through this process, we think we have arrived at the best four holsters for Keltech pistols. Each, in their own way, is a great holster, and which one is right for you depends on your particular requirements. The DTOM Combination Pocket / IWB Holster – Is It For You? I suspect so. For most Kel Tec owners, this holster offers the best combination of carrying styles, concealment, and protection. The ability to convert it easily from a pocket holster to an IWB one also gives it great advantages. That said, there may be a few reasons why this holster is not perfect for you. First and most importantly, you should check that your particular gun fits in this holster. Whilst, in our tests, it fitted the Keltechs we use well, if you have an unusual variant you should make sure it fits – getting a poorly fitting holster is a great way to lose your gun, or to accidentally shoot yourself. Give the guys at DTOM a call, and I’m sure they’ll be happy to help. Secondly, I know that buying a pocket holster can be a bit of a minefield. This is because, to state the obvious, everyone has different pockets, and a pocket holster that may be suitable for a hunting jacket is going to feel a bit bulky in a dressing gown. When used as a pocket holster, I think that this holster is one of the best available, and of course you can also use it as an IWB holster. My point, however, is that if you are looking to get a pocket holster you should make sure that this one fits in your pockets correctly. Lastly, note the lack of dedicated locking mechanisms on this holster. Whilst I know that, when carried IWB, your Keltech will be held in the holster by the pressure of your belt, I would not recommend this holster for inexperienced gun owners. You need to be pretty confident on your carrying technique before getting a holster that doesn’t lock your gun, even when carrying IWB, and so if you are new to carrying your Keltech I recommend getting a holster with a locking system. So, in short, if you want an OWB holster for your Kel Tec, or conversely one that is really tiny, this holster is not for you. For the rest of us, this holster makes a great partner for most Kel Tec pistols, and comes highly recommended. Choosing a winner for this review was really difficult, because it seems that Kel Tec owners are blessed with a great range of quality holsters. However, I’ve chosen this holster as my recommendation for a number of key reasons. Let’s start with the most obvious advantage – this holster is BOTH a pocket holster and an IWB holster. It achieves this by the belt clip being removable. The people I spoke to for this review praised this feature at length, and said that they wished that it was available on other holsters. The reason for this is simply that a lot of people carry their Kel Tec in various circumstances – whilst out hunting, and also whilst out walking the dog. Having the ability to carry your weapon either in your pocket or IWB gives you that felxibility. Secondly, the draw on this holster is great, especially considering that it covers the trigger mechanism of your gun, and especially given that it is a pocket holster. A common problem, as I’m sure you are aware, with pocket holsters is that with cheap ones you end up drawing the holster from your pocket rather than just your gun. Although, as with any holster, the draw on this one is dependent on practice, in our test we were able to achieve quick draw speeds with a minimum of familiarization. I know that many Kel Tec owners really value a holster that will allow them to conceal their weapon, and this one performs very well in this respect. The foam padding in the holster core, whilst making the holster comfortable to carry, also helps to break up the outline of you weapon. Though some nylon holsters can feel cheap, this one does not. It is made from a tough, woven nylon that actually feels like a quality material, and is pretty hard to damage no matter what you are doing with your gun. In addition, and again unlike many synthetic holsters, wearing this one does not lead to excess sweating, ensuring that your gun doesn’t end up covered in sweat on a hot day. 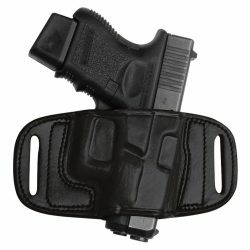 In addition to the fact that this holster can be use both as an IWB and pocket item, it can be worn on your hip or behind your back. Bear in mind that, if you are carrying a pistol on the small of your back, you need to order the OPPOSITE holster to your handedness – so if you are right handed, order the left hand for small of the back carry. I know some people will feel that I’m laboring the point, but to my mind one of the primary things you should look for in a holster is safety features, and this kind of nylon holster often falls down in this regard. This item, by contrast, offers a great level of protection for the trigger mechanism of your Kel Tec, and for that reason, amongst the others above, comes highly recommended. If you have aftermarket sights fitted to your Kel Tec pistol, they are probably not going to fit in this holster. That said, you will be hard pushed to find any holster that will accommodate them, so this holster is no worse than the majority in this respect. Overall, in my opinion this is the best value holster for Kel Tec pistols around at the moment. The ability to swap between carrying styles, the great concealment offered here, and the superior draw speed mark it out as one of the best holsters available. As I said above, choosing my favorite holster today was quite difficult, and looking at this one you can see why. This is an amazing holster for most Kel Tec pistols, and is only held from the top spot because I think the DTOM holster above is a little but safer for the inexperienced gun handler. That said, if you are looking for the best concealment possible whilst safely carrying your Kel Tec, and are experienced enough to work with a pretty minimal holster, this one is great. It covers the minimum necessary area of your gun, allowing you to conceal it easily and also improving draw speed. 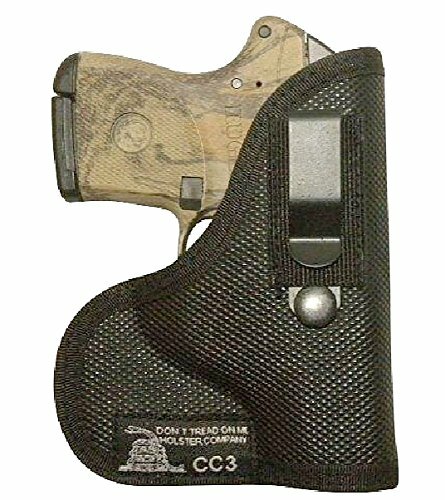 The people we talked to for this review said that this holster offered the best concealment on their Kel Tec pistols. This is largely due to the soft leather construction used here, which unlike polymer holsters does not stick out from the gun. 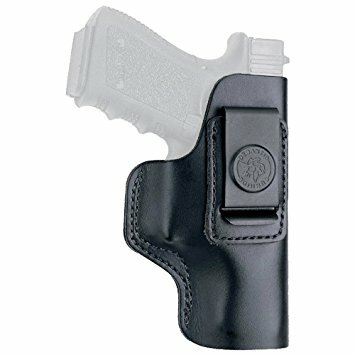 When worn IWB, this holster molds itself to your gun, ensuring the minimum possible profile. First off, let’s talk about the materials used here. I know that a lot of people prefer the classic feel and look of a leather holster, and this is one of the reasons I’ve chosen this one as our runner up. The leather used here ix of high quality, and feels like it will last a lifetime. The belt clip on this holster is also strong, which is especially useful if you own one of the bulkier Kel Tec variants. When paired with a solid gun belt, this holster stays remarkably secure, ensuring that your gun is always where you need it should you find yourself in a dangerous situation. I know it is important to some people, so I will mention that this holster is totally made in the USA. Quite apart from partiotic reasons for buying from the US, this also means that you can be assured that the production quality here is second to none, and that if you have a problem you can always call the guy who made your holster! It’s not custom molded, and so if your Kel Tec is in a particularly small variant it might feel a bit loose in this holster. There are ways around this, of course, but it might be a slight annoyance for some owners. The other minor disadvantage here is that with a large gun, this holster feels a bit top heavy. This is common amongst this kind of minimal holster, however, and so I can’t really criticize this item on that count. All in all, this is a great holster, and offers good value. If you are looking for a holster for your Kel Tec that offers the best concealment possible, this is the one to go for. Not recommended for inexperienced gun handlers due to it’s slight lack of safety features, for anyone who has a bit of knowledge this is a great option. I have to admit that I was a little dubious when it came to reviewing this holster, if only because I had never heard of Tagua before. It really surprised me, though – this is a simple, straightforward holster for your Kel Tec that offers great value. This is something of an old-school holster, but none the worse for that. The design incorporates two belt loops that can accommodate a wide range of gun belt thicknesses, and hold the holster and your gun pretty securely. The material used here confused me slightly, but I believe it is some kind of synthetic leather! This is not a criticism, because this holster seemed to be constructed very well. The material appears to be very tough, also, and I’m sure this holster will give a few years of service. This holster actually reduces printing quite well. This is surprising on an item that is not sold as a concealment holster, but it is clear that Tagua have thought about concealment when designing this item. The belt loops, whilst obviously being necessary to secure the holster itself, do a good job of breaking up the outline of your weapon. Because of its minimal design, this holster is also a good choice if you have rear mounted red dots on your Kel Tec. The fact that the rear of your weapon is left exposed when carrying it in this holster means that a lot of aftermarket accessories will fit without any problem. The holster is alo pretty comfortable, especially at this price point. The draw … is not very good. If you practice a lot with this holster, I’m sure that you can get good at drawing with it, but our test version was a little bit awkward. The problem is that the material used here grips the weapon a little too tightly, and so your Kel Tec tends to take a little bit more force to pull out. If you are using your Kel Tec in a professional capacity, it might be worth looking elsewhere for precisely this reason. Well, I’m not sure that the stitching used here is going to last for a lifetime. Still, at this price I guess you can afford to get this holster, use it for a few years, and then get another one! Perhaps not recommended for tactical use, due to the lack of locking mechanisms on this holster. Without meaning to scare you, with this kind of holster it is pretty easy for an experienced attacker to grab your weapon from you, so if you think you are likely to be in this situation, get another holster. For the price, very good. If you are looking for a pretty basic, dependable holster that does all the basics well, you could do worse than this one. Of the budget holsters I looked at for this review, this one came out on top because it keeps your weapon stable really well. This is an expensive, fully-featured holster that comes highly recommended if you use your Kel-Tec in a professional capacity. Let’s start with the overall design used here – it looks great! I know that a lot of people claim not to care about the way their holster looks, but in truth if you’ve spent a bit of money on a Kel Tec it’s worth getting a holster which looks the part. Unlike the other holsters I’m reviewing today, this is a Kydex item. If you haven’t used a Kydex holster before, I highly recommend it, and this holster is a great example of why Kydex is becoming the material of choice for premium quality holsters. It is incredibly tough, and molded specifically to every Kel Tec pistol this holster is available for, giving a fit around your gun that is simple not possible with fabric or leather holsters. In addition, the variable retention screws on this holster allow you to easily set up your Kel Tec for competition or hunting. Sometimes, you need your holster to hold your weapon just that little bit more tightly, and with this holster you can achieve that easily. The Kydex used here offers a few advantages. It fits each Kel Tec pistol we tested pretty well, holding each weapon securely. In addition, Kydex is incredibly strong, and I’m confident that this holster will provide many years of service even for heavy users. As you would expect for this price, this holster has adjustable cant. This is great if you like an unusual carrying angle, or if two people share your Kel Tec and each prefers to carry and draw differently. Whatever weird technique you’ve developed over the years, this holster will accommodate you! The full-length sight channel on this holster is a feature which is very unusual in holsters of this type, and means that if you have certain aftermarket sights fitted to your pistol, you can keep them on your gun when it is holstered. This holster can be used in appendix, hip, side, and back carry configurations. This is great, especially if you often take your Kel Tec out hunting, because it means you can keep it out of the way of all the other kit you are weighed down with! If you are looking for a holster with a few more features than standard, and one that will last for a lifetime, this is the holster to go for. It feels incredibly tough, so if you are taking your Kel Tec pistol into hostile environments this is a good option. Whilst the DTOM holster above is the best value holster I reviewded today, this is the best overall. Will these holsters fit my Kel Tec pistol? This is a very difficult question to answer, because of the numerous variants Kel Tec pistols come in. The best approach, to my mind, is to phone the manufacturer of the holster you want to buy, and check directly. This is especially true if you have an unusual gun, or have fitted aftermarket accessories. Some are good, some are bad. The Fierce Defender item, whilst being the best holster in many ways, actually offers the worst concealment. 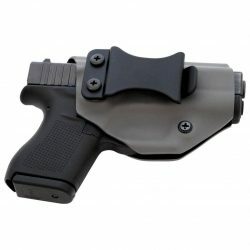 For most people, I think the DTOM holster offers a good level of concealment without being so small as to be dangerous. I know that no review can ever recommend a holster that is perfect for everyone, and every time I recommend a holster I get emails from people who despise the one that I choose. However, as always, I’ve tried to pick a holster that will suit the needs of most people, most of the time. This is the reason why the DTOM Combination Pocket / IWB Holster is my choice. The convenience of being able to swap from IWB carry to pocket carry, on it’s own, marks this holster out as one of the best available for your Keltech. You can wear your weapon IWB whilst out and about during the day, and then tuck it into your pocket when you go to the bar in the evening. An amazingly, in both configurations this is one of the best holsters of its type we have tested. I am always sceptical of nylon holsters, preferring the extra security afforded by Kydex or other polymer holsters. However, the nylon used here is much thicker than on your standard cheap nylon holster, and for that reason is not a problem in this holster. The people I spoke to for this review praised the longevity of the material, which they said had given them many years of service. Lastly, the concealment offered by this holster is great. The padded nylon breaks up the outline of your weapon pretty well, even when you are wearing quite thin clothing, and is actually more comfortable to wear than many polymer holsters. Kel Tec pistols (and some rifles like the sub 2000) are becoming increasingly sought after due to their price, comfort and reliability. In short, if you are looking for a superior holster for your Kel Tec pistol, this is a great one to go for. Offering all the advantages of both an IWB holster and a pocket holster, it excels in both configurations, and forms a great pairing with most Kel Tec pistols.